A couch or sofa is an item of furniture that seats two or more people in the form of a partly or fully upholstered bench. The word “sofa” is actually Turkish, and is derived from the Arabic word suffa, which means “carpet” or “divan”. The word “chesterfield” was first used to describe a sofa back in the 1900s; in the UK it refers to a deep buttoned couch with a back and arms that are the same height. Originally made from leather but now available in practically any kind of upholstery you might require, it was initially commissioned by Phillip Stanhope, the 4th Earl of Chesterfield (1694-1773). The Earl was not only a much-admired politician, but he was also a writer and this combination would establish his credentials as something of a trendsetter and style icon. He requested a local craftsman to build him an item of furniture that would permit a gentleman to sit upright, while still being comfortable, and not cause their (tailor-cut, often starched and stiff) clothing to wrinkle or create unsightly creases. In the 18th century, the leather Chesterfield sofa was often found in the homes of the wealthy aristocracy. In this enlightened era, it is a more commonly heard name – though one always said with no small amount of pride, and the comfy, stylish and relaxing sofa can be found in homes all over the country either as a brand new addition or an old family favourite. 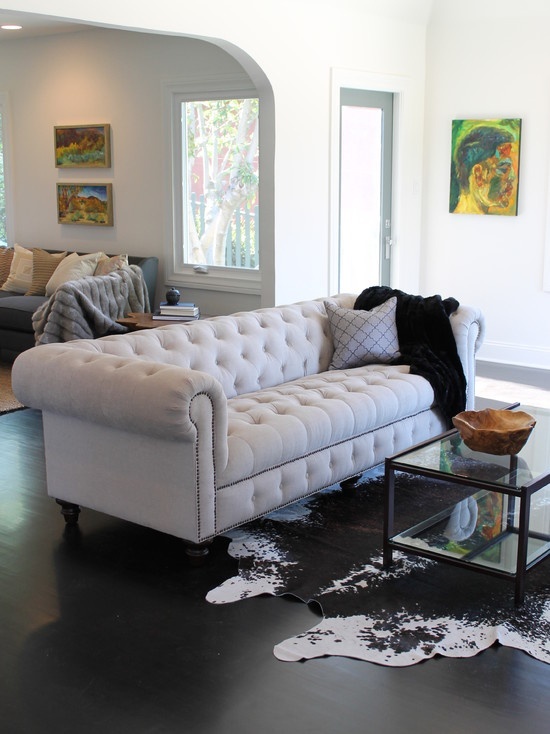 Over the years, the Chesterfield sofa has become symbolic for a variety of things. It quickly became a British style symbol, having been successfully shipped through all the colonies of the British Empire by the officials of the Royal Army. It was also symbolic of a gentlemen’s study, where it became iconic of a dimly-lit but comforting room, pleasurably clouded with cigar smoke and the smell of brandy. Since the 19th century, it has also retained an association with Sidmund Freud and the industry that sprang up in his footsteps, who, during his original therapy and hypnosis sessions would ask patients to sit or recline on his chesterfield while he delved into their psyche. Though the Chesterfield was once an elite status symbol, it is now a desirable item of furniture for the modern home or office space. Synonymous with class and high-end luxury in homes all over the world, the Chesterfield remains to be the sofa that perfectly combines both style and comfort. If you would like to add one of these gorgeous couches to your home, you will find a fantastic collection of Chesterfield sofas at Sylvester Oxford.